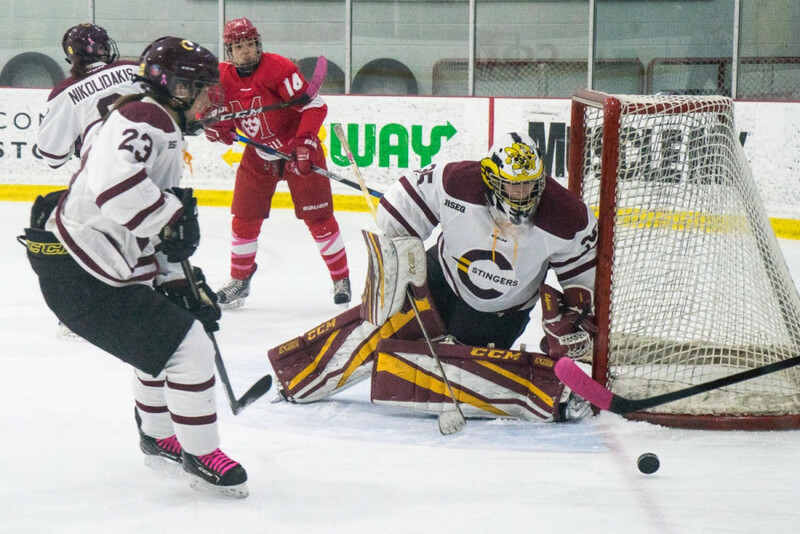 Concordia’s women’s hockey team all-stars Claudia Dubois and Katherine Purchase are headed to British Columbia next weekend, where they will be taking part in Hockey Canada’s annual Fall Festival. The Fall Festival is scheduled to kick off Saturday in Calgary and Dawson’s Creek, BC. and showcases women’s hockey’s best and brightest as they compete for a spot on Team Canada’s roster. The two will be joined by fellow teammates from the U Sports all-star team that competed at Canada’s National Women’s Hockey Development camp last month in McGill’s Jade Downie-Landry, and Université de Montreal’s Catherine Dubois. Concordia is the only U Sports school to be represented by two players. Head coach Julie Chu believes this speaks to the hard work of her players and the culture of the program she has been building over the last few years. Dubois and Purchase will be among 52 of the country’s best women’s hockey players, all vying for a spot on Team Canada’s senior roster ahead of the 2018 Nations Cup taking place in Saskatchewan this November. Among the candidates are athletes in the NCAA, in the CWHL, and former olympians—including recent medalists from Pyeongchang, but neither Dubois nor Purchase are letting this notion get to them. Purchase feels that her and her teammate are at an advantage going in as student athletes, as they know no one has high expectations for them to beat out superstars like Laura Fortino, who helped the Markham Thunder take home the CWHL’s Clarkson Cup. “There’s no pressure for us, we get to just go and play our best and enjoy the experience,” she said. While Dubois let on a little bit of anxiety about competing with some of Canada’s best, her expression quickly turned to excitement. Purchase was quick to give recognition to the program in which she’s developed and the culture brought in by Chu when she took over. She notes that this is a moment of recognition for the coaches who have been able to come in and develop such large groups of elite players, including those who represented the program with the U Sports team last month, and now their two representees at the Fall Festival.